Hi everyone! Today I have a massive piCture pOlish swatch post. First, this nail art showcases how harmoniously all of their colors are together. This design literally popped into my head as I was staring at the bottles. Inspired by none other than the vivid sea creatures from the beautiful Australian Great Barrier Reef, I think this look is quite fitting for showcasing the equally vibrant shades from the Australian boutique fashion nail polish brand! Let’s begin with swatches of the cream polishes! I must say that piCture pOlish never disappoints in delivering gorgeous colors with flawless application. 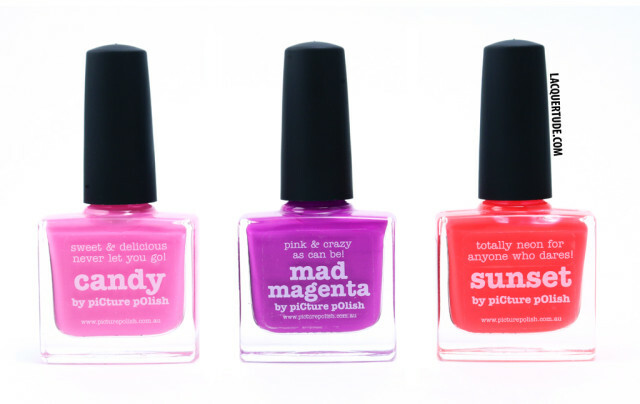 Mad Magenta is my holy grail bright pink magenta. I had been searching for this perfect shade for a long time, until piCture pOlish knocked it out of the park! It was love at first sight for me. I wore this polish alone for 4 days with no chipping, only tons of compliments! 2 coats, no staining upon removal. Sunset is an eye searing neon orange. Sigh…what can I say, it’s so amazing that it freaked out my camera. 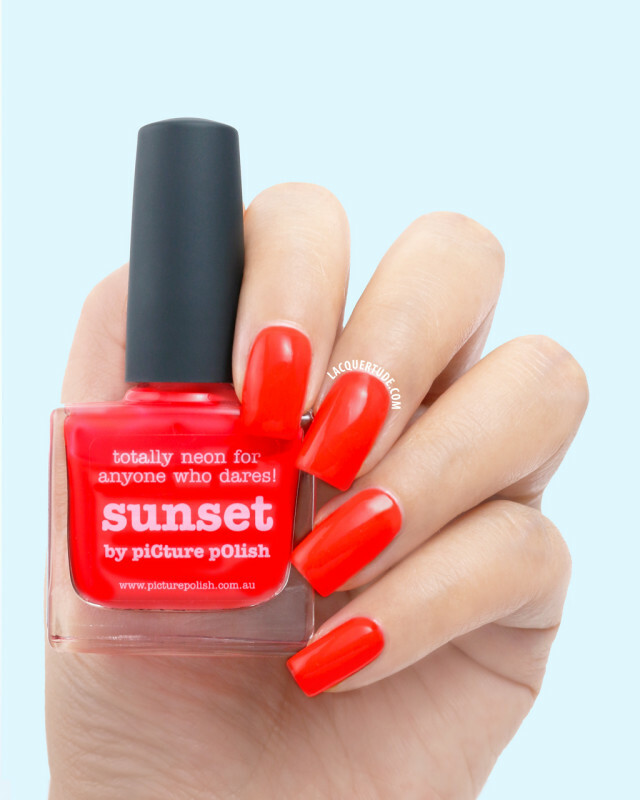 But the ladies at piCture pOlish couldn’t just leave it there, on top of the daringly bold color, Sunset also has a flawless formula! 2 coats, no staining upon removal. Candy is as sweet a pink as a color can be. Normally, this type of pink doesn’t look very good with my skin tone, but somehow, the combination of bright and soft makes this color super flattering to wear. I feel girly and happy when Candy is on my tips ♥ 2 coats, no staining upon removal. 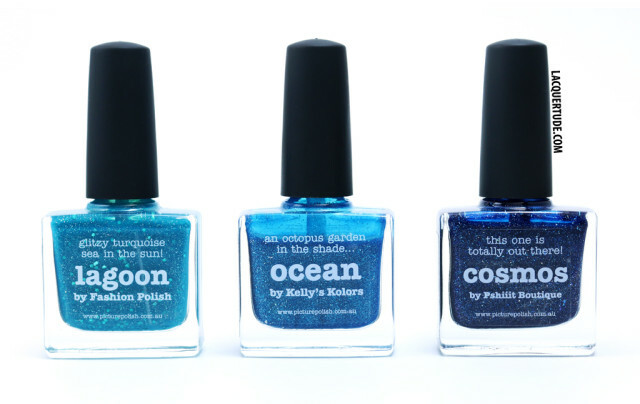 Next, I created the gradient ocean back drop for my nail art using three of my favorite blue piCture pOlish collaboration shades, all by nail bloggers that I follow on a daily basis! Lagoon is one of the recent collaboration shades with Sam from Fashion Polish. I’ve been a long time admirer of her blog and this shade, being in the turquoise family (my favorite shade of blue), took my breath away since the first day of its unveiling. I worked really hard to color correct my photo to showcase this vibrant yet mysterious, oceanic lagoon shade. I have to say that it was pure genius for the creators to add turquoise glitters amid the surrounding holographic particles. Please go to Sam’s blog for her amazing swatches and inspiration of Lagoon. 2 coats, and as usual with any blue polishes, I applied 2 coats of base coat to prevent possible staining. 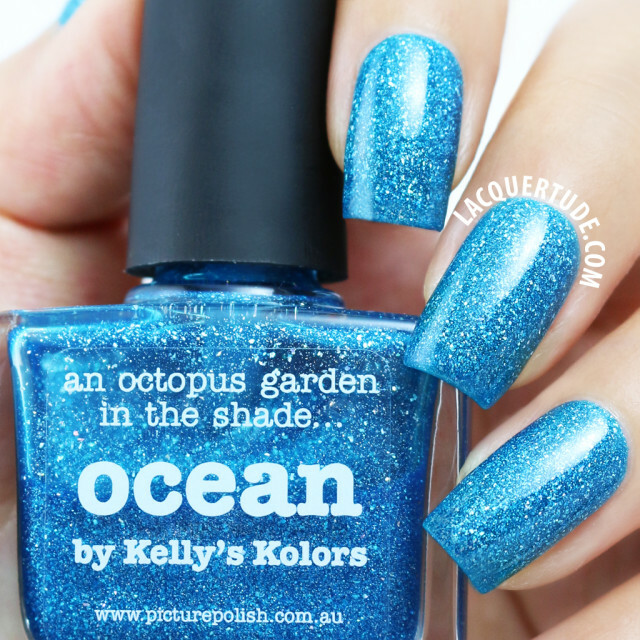 Ocean is created in collaboration with Kelly from Kelly’s Kolors. I’ve always LOVED Kelly’s swatches. I secretly think she has some of the cutest short nail shapes out there. If you haven’t yet, you should really head over to her blog and check them out! In case I haven’t spelled it out clearly, blue is my all time favorite color, and turquoise is one of my favorite shade from the blue family. Well, Ocean is the perfect blend between ocean blue and turquoise, and combined with the jelly-esque formula, this shade is to die for. 3 coats with 2 coats of base coat. 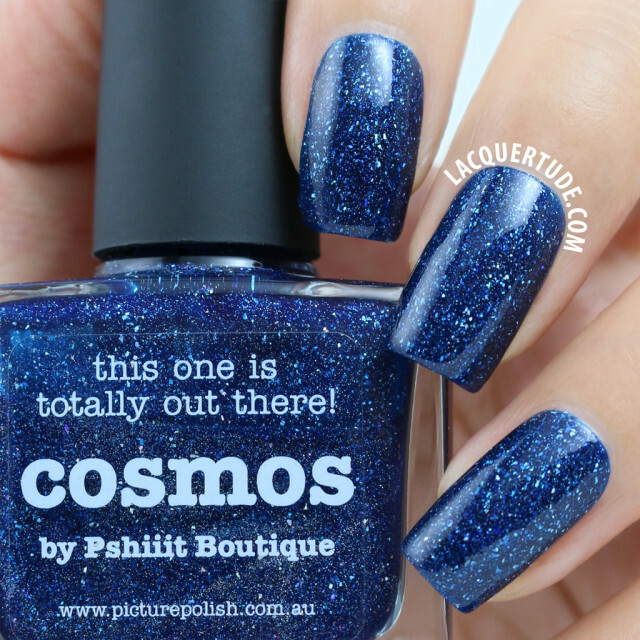 Cosmos is by one of my favorite nail bloggers of all time: Camille from Pshiiit.com. In fact, I loved her beautiful photos, her creative nail art, and the honesty and humor in her writing so much that in spite of her blog being written in French, I read every single post (thank you Google Translate!). 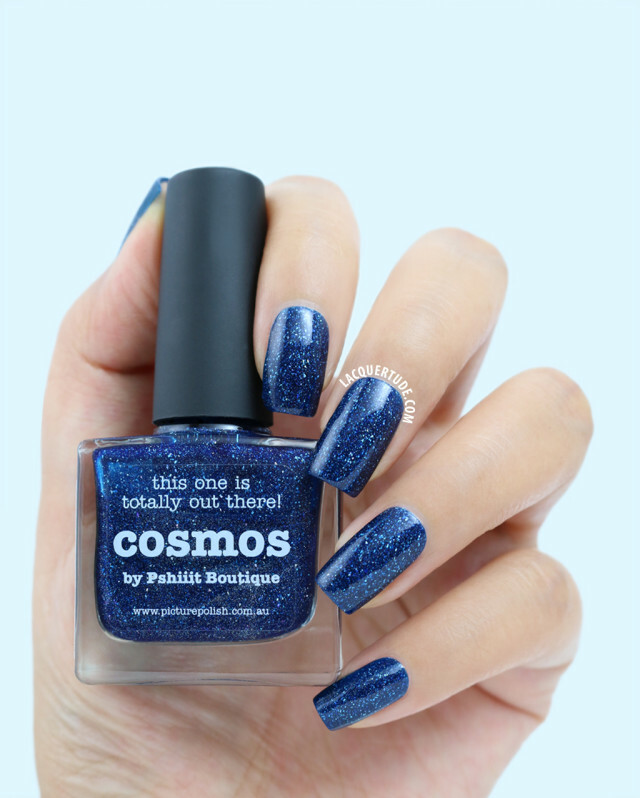 Cosmos is exactly as piCture pOlish says, “totally out there!” Whenever I wear this shade, I can’t help but stare at my nails as I dream of the galaxies beyond our world. Some days, I even see constellations in the holographic particles. It’s also the perfect shade of dark blue that I find easily matches my outfits. 2 coats with 2 coats of base coat. This is amazing! 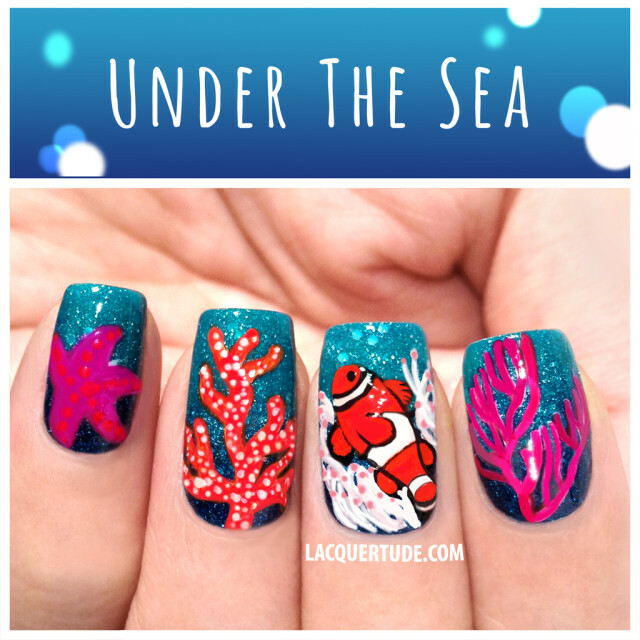 Lagoon is the perfect base for the nail art!